6:27pm: The trade is official, according to a tweet from the Suns. 3:49pm: Bartelstein is working with the Suns to get Ellington to a playoff contender after this deal is completed, tweets Adrian Wojnarowski. While a trade is possible, the veteran sharpshooter could also be waived. 3:30pm: The Heat are also sending Wayne Ellington to Phoenix in the trade, tweets Shams Charania of The Athletic. That makes the deal more interesting, as the Heat are now in position for significant savings this season as well as next season. The lottery-bound Suns likely don’t have much use for Ellington, but could flip him in another trade before the deadline, as long as they don’t aggregate his salary with another player’s. Ellington has the ability to veto a trade, so in order to sign off on the deal, he may expect Phoenix to subsequently trade or release him. He has given his approval, agent Mark Bartelstein confirms to Barry Jackson of The Miami Herald (Twitter link). Additionally, as cap expert Albert Nahmad observes (via Twitter), Johnson will have to waive most or all of his trade bonus to make the trade work from a salary-matching perspective if Ellington’s salary is included. 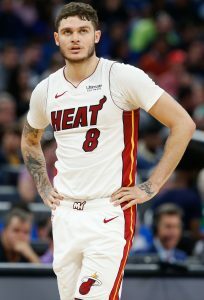 2:41pm: The Heat are in agreement with the Suns on a trade that will send guard Tyler Johnson to Phoenix, reports ESPN’s Adrian Wojnarowski (via Twitter). Ryan Anderson will head to Miami in the deal, tweets John Gambadoro of Arizona Sports 98.7. Johnson, 26, has averaged 10.8 PPG, 2.8 RPG, and 2.5 APG with a shooting line of .426/.353/.693 in 44 games (25.5 MPG) for the Heat this season. Although he has been a solid role player in Miami, Johnson’s salary far exceeds his on-court production. Due to a back-loaded offer sheet from the Nets, which the Heat matched in 2016, the fifth-year guard is earning approximately $19.25MM this season, with a 2019/20 player option worth the same amount. His current-year cap charge will increase a little more when he’s dealt, since his contract features a 15% trade kicker. That bonus will amount to another $1MM+ on his ’18/19 cap hit, assuming he doesn’t waive it. His option year will be unaffected. Anderson, who has a $20.4MM cap hit of his own, was the only player on the Suns’ roster making more than $11.75MM this season, making him the logical returning piece for Johnson. The 30-year-old was traded from Houston to Phoenix during the offseason and has played sparingly for the Suns, averaging 3.7 PPG and 3.0 RPG in 15 games (18.5 MPG). While Anderson has been a lethal outside shooter in past seasons, he has hit just 20.6% of his three-pointers this season after entering the year with a 38.2% career rate. Anderson has a $21.26MM cap charge for 2019/20, the final year of his four-year contract, but that figure is only partially guaranteed for about $15.64MM. That will save the Heat some money next year, and they could reduce Anderson’s cap hit by $10MM+ more if they elect to release him and stretch his contract by July 10. It’s hard to imagine Anderson will have a role in a crowded Heat rotation, but the Suns presumably plan to feature Johnson. He’s not a traditional point guard, but Johnson is capable of handling the ball and Phoenix – which lacks an answer at the point – will likely give him a chance to do so. YES! Getting rid of that albatross of a contract. Settle down and wait till the whole trade is laid out. Suns are probably getting decent picks. Makes no sense. If they gave up one of the wings for a player and no draft pick in return bad trade. Overblown contract, average performance, and player option. For Phoenix they would most likely be sending Ryan Anderson in trade as it’s an expiring contract after this season along with picks but still can’t understand why Phoenix won’t get a true PG. I don’t think a combo guard will help. I agree on the combo guard comment. It’s just a feel good trade for both teams. Anderson gets playing time in Miami. Suns get a band aid for this season and a trade chip next year. Exactly. Johnson is not a bad player at all. People make the mistake of equating bad contract with bad player all the time. Johnson could probably play well with Booker. Suns get someone who helps now, Heat save money next year if they stretch Anderson. No draft picks exchanged because the Heat already owe too many. This is just about money for Miami. Of course you could look at it the other way. He is a former overall #1 pick who has missed around 100 games in his first two seasons and is being paid far more than he has shown on the court. To be clear, there’s no reporting yet suggesting that they’ll stretch Anderson, as far as I know. That was just a hypothetical. I doubt they’d do it unless it was the difference in whether or not they were in the tax. Exactly. Or hes an expiring contract in the offseason or during the year. Also, in case of injury to Dragic or Waiters, or some kind of a trade, that’s an opportunity for an increased role, as he has increased his 3 point shot rate by a large percentage from 2 years ago, where he was used in more pick and roll situations. Yes! We got our PG of the future! Good day for Tyler J, should be clear starter! Clearing his trade bonus, bummer. Trade works all around. Good mesh for Booker, like with Oubre, similar attitude. PHX finally has a decent vet at PG,not good enough to threaten the tank, but good enough thay the Suns could for instance look past Morant to Reddish if they want to. As I was on the fence financially about it. I’d much rather have Tyler Johnson at his number, than Ryan Anderson at his number. I expect some kind of other move has to be coming if that’s what they get back without anything else. This helps Phoenix defensively at the guard position, and gives them a viable option there. Not going to lie, I’m going to miss Tyler Johnson. He was disruptive defensively, and a relentless worker, and the kind of player you want on your team; A true Miami Heat player.